The Arabian horse has one of the world's longest histories, going back thousands of years; its official breed registry is the oldest in the world. Its striking beauty and even temperament have made it a popular breeding horse throughout the ages, and Arabians have contributed their elegance, spirit, and intelligence to almost every light horse breed that exists. Many pony and warmblood breeds count the Arabian among its ancestors, too. Horse enthusiasts around the world have much for which to thank this versatile, healthy, loyal breed. While the very beginnings of the Arabian horse are hidden in the ancient desert sands, most experts agree that Arabians originated in the vicinity of the Arabian Peninsula. The Bedouin tribes trace their common history with Arab horses back to 3000 B.C. and keep meticulous ancestral records, also known as pedigrees. The Arab’s hardiness is a result of the harsh desert climate and terrain in which they evolved. The Bedus used the horses as transportation, beasts of burden, and war mounts. So prized were these horses that their keepers brought them into their families' tents at night for warmth and protection against theft and harm in the cold desert night. Reflecting this ongoing bond is the fact that many purebred Arabian names today begin with "Bint" or “Ibn.” These prefixes in Bedouin roughly translate to "daughter of" and "son of," respectively. Genghis Khan, Napoleon, George Washington, and Alexander the Great are among the countless other historical figures who owned and rode Arabians. In the seventh century A.D., the prophet Mohammed urged his followers to treat their Arabian horses with kindness and respect, particularly the mares who ensured the breed's quality and continuity. He taught that the Arabian was a gift from Allah himself, and treating these horses well helped ensure happiness in the afterlife. Arabian horses have lithe, compact bodies that suggest strength and speed; their heads are wedge-shaped, with refined features and a dished (concave) profile. Their backs are short, and ideally, they have sloping shoulders and powerful hindquarters. Their physical presence suggests refinement, power, agility, and elegance. Arabians are small in stature compared to many riding horses, standing between 14 and 15.2 hands high (56 to 62 inches at the top of the shoulder). They are fine- to medium-boned and weigh from 800 to 1000 pounds. 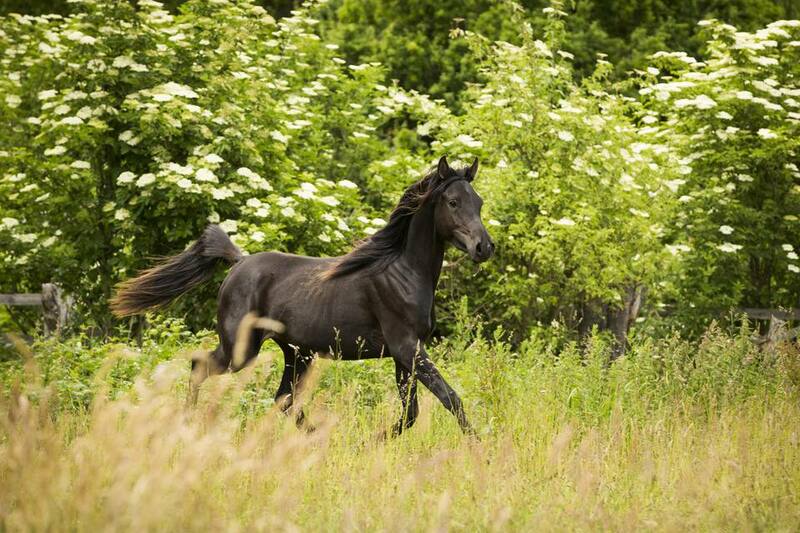 Some Arabian horses of Polish bloodlines exceed 15.3 hands high (63 inches). Selective breeding has produced both fine-boned and more robustly built Arabians, but all share the breed's general appearance and grace. Arabian horses have taught many youngsters about the joys and responsibilities of horse ownership. Many new equestrians learn to ride on the backs of these reliable, even-keeled mounts. Arabians excel in almost every horse sport. They are the horses of choice for long-distance trail competitions and are capable of traveling long distances over challenging terrain in intense heat. They make elegant dressage horses, provide thrills comparable to any Thoroughbred on the racetrack, and are impressive in the show ring in pleasure classes, over jumps, and in native Arabian costume classes. The Arabian Horse Association recognizes the colors bay, gray, chestnut, black, and roan, but Arabians have all manner of white facial markings and white socks or stockings on their legs. Some bloodlines are known for their specific color or markings, like the high white socks and white faces of the Crabbet bloodlines. Arabians are never dun, cremello, palomino, and buckskin because purebreds don't carry dilutions genes. Archeological evidence, however, suggests that they existed in ancient times. Sabino — a type of white pattern on the skin and in the hair — is the only spotted pattern now carried in pure Arabian lines. The skin of the Arabian horse is black, except for under white markings. The dark pigmentation protected the horses against the harsh desert sun. The gait of an Arabian is ground-covering and smooth to ride, despite the horse's relatively small size. Arabian horses are easily recognizable for their elegantly arched necks and fine, silky manes and tails. A delicately dished face with wide intelligent eyes and arching neck are hallmarks of the purebred Arabian. Arabians have a high tail carriage and floating gaits (forward movement). Arabians are quick learners, alert to their surroundings, and sensitive to their environments and people. Arabians are the ancestors of many modern-day horses, from the tall Trakehner to the diminutive Fallabella. Arabian horses have one less vertebra than other breeds of horses. Breeders take meticulous care to keep the bloodlines of Arabian horses pure. No horse with any blood of another breed can be registered as an Arabian, no matter how minute the dilution. Marengo was the favored mount of Napoleon Bonaparte. Skowronek was one of the outstanding sires from the Crabbet Arabian Stud Farm in Britain; he passed down his genes to generations of North American Arabian horses. Cass Ole starred in the 1979 movie The Black Stallion starring Mickey Rooney. The movie was based on the novel of the same name written by Walter Farley. Is the Arabian Horse for You? Arabian horses can be loving, loyal, responsive companions, and many older Arabians make wonderful family and beginner horses, whether ridden or driven in harness. They tend to be more people-oriented than some other breeds and enjoy the company of their human families. Where a purebred Arabian may not be suitable, crossbreds such as the Anglo-Arabian, Shagyar Arabian, ArabxQHs, and American Show Horses can fill the gap. The Arabian's longevity, hardiness, and excellent overall health make it an ideal horse for nearly anyone. It adapts well to a wide variety of climates and conditions and responds in kind to affection and care.